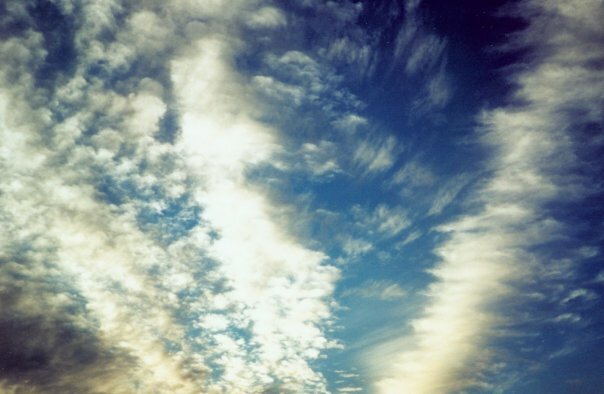 Photo of the Week.. Clouds blow briskly against a vivid blue sky. Astronomy news for the week starting Friday, May 14, 2004. The Moon wanes through crescent the early part of the week, when it will be nicely visible in the morning hours as dawn approaches. On the night of Tuesday the 18th, it will pass through new. By the evening of Thursday the 20th, the now-waxing crescent will grace the sky low above the horizon below brilliant Venus. The western evening sky gifts us with an unusually nice gathering of planets. While Venus now settles ever closer to the horizon as it prepares to swing between Earth and Sun, it still sets an hour past the end of twilight. To the east, up and to the left of Venus, is Saturn, which lies firmly within the confines of southern Gemini. Just to the west of Saturn, find dimmer Mars, which recently invaded Gemini as it approaches the ringed planet for a conjunction between the two on May 24 (when they will be but 1.6 degrees apart). Notably farther to the east is bright Jupiter in Leo, which is now crossing the meridian to the south just about sundown. Venus also reaches a special point in its orbit, as on Monday the 17th, it becomes "stationary" relative to the background stars and thereby enters retrograde motion, the event announcing the rapid disappearance of the planet from the evening sky. By coincidence, less than a day earlier, Neptune, in Capricornus, enters retrograde as well. Of the naked-eye planets, the morning sky contains but Mercury, which reaches its greatest western elongation on Friday the 14th. Unfortunately, the morning ecliptic is rather flat against the horizon, so the little planet will nearly lost to morning twilight and be difficult to find at best. Try also to find Comet NEAT, which will be up and to the left of Gemini. Binoculars will help. The stars of spring now rule the sky, winter's Capella replaced by the bright orangy glow of Arcturus in Bootes, the brightest star of the northern hemisphere. The classic way of locating the star is to follow the curve of the handle of the Big Dipper to the south. Then keep the curve going, and it will next pass through first magnitude Spica in the constellation Virgo, which contains the autumnal equinox, the point in the sky where the Sun crosses the celestial equator on its way south to announce the beginning of astronomical autumn. Spica lies to the northeast of the distorted box of stars that makes Corvus the Crow, whose two top stars point back to the Spica much as the two front bowl stars of the Big Dipper point back to Polaris in Ursa Minor. South of Spica lies the tail of Hydra (the Water Serpent), and farther south the center of Centaurus. Curiously, Spica is almost exactly south of Mizar and Alcor in the Big Dipper, and almost exactly north of the greatest globular cluster in the sky, Omega Centauri, which is decently visible only south of latitude 35 degrees north.